Hopefully you didn't read the title as "Effed up" because there is definitely an "i" in there. The Hunger Games. You know I loved the books, and was eagerly awaiting the movie's release, and had plans to dress up. Well, here are the photos!! 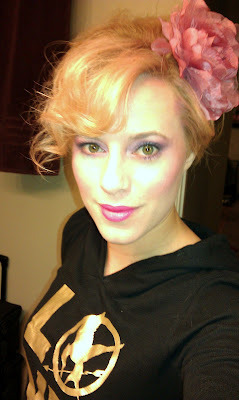 The products used to achieve my Effie look. 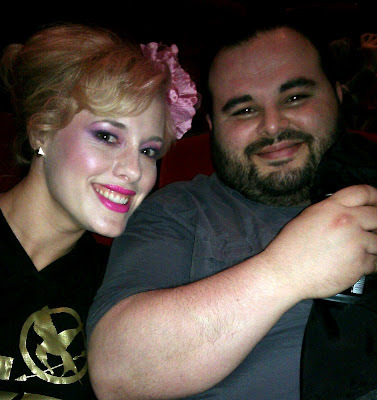 All set in my hunger games thermal hoodie! And day of! These are cell phone pics, sorry the quality is poor! In the theater, ready for the movie!!! I LOVE it!! where did you get that hoodie? you look adorable!! i love pinks and purples with eye shadow - you are ROCKIN it! Seriously you are gorgeous without makeup- I am a little bit jealous!!! I love that you dressed up as Effie!! I still have to see the movie! How do you get your bangs like that? I hate my bangs... stupid cowlick that makes them weird!! Love your Effie look. You look gorgeous as always!!! I totally read that as effed up the first time... so I immediately read it again ha ha! You look AMAZING! You did such a great job with your effie look! Love it.